The Western monarch butterfly population in California declined 86 percent in 2018 compared to the previous year, according to the Xerces Society for Invertebrate Conservation, a nonprofit group that conducts an annual survey of the species in the Western United States. Even more stark for the species is that it has dropped a shocking 97 percent since the 1980s, the agency reports. The butterflies spend winter in California. Many other North American varieties travel to Mexico for the same season. In California, they spend the season in eucalyptus trees. According to scientists, the Western monarch populations are in trouble primarily because of habitat loss and pesticides. Environmental conditions, including heavy rain in the states, were another impactful factor. Why are the butterflies important, or their lowered numbers significant? There are couple of reasons beyond the mere beauty of the creatures. Their decline can impact human food systems. Additionally, monarchs and other pollinators are part of a “natural food web and ecosystem,” so providing enough habitat, like milkweed for monarchs, is essential in maintaining a balanced food web within the ecosystems that are critical in sustaining us, the advocate agency said on its website. Second, monarchs are good for the science and education communities. According to the Xerces Society, congregations of wintering monarchs have been found at more than 400 sites along the California coast, from Mendocino County in the north to San Diego in the south. Monarchs are generally present from October through February and wintering populations may peak at different times. For its report, the Xerces Society analyzed results from 97 of its survey sites, accounting for 77 percent of the state’s total wintering population. In 2017, these 97 sites hosted about 148,000 monarchs. In 2018, scientists and volunteers counted just 20,456. The society conducts annual Thanksgiving and New Year’s counts. It said there is no substantial evidence of a delayed migration and butterflies are not being reported in other parts of the country. A separate 2017 study by Washington State University researchers found the species likely will go extinct in the next few decades if nothing is done to save it. A four-decade-old University of Florida study found that the number of caterpillars and butterflies in North Florida has been declining since 1985. Since 2005, the numbers have dropped by 80 percent. These specific insects winter in Mexico, but the results suggest that butterfly populations across the continent are sharply dropping. 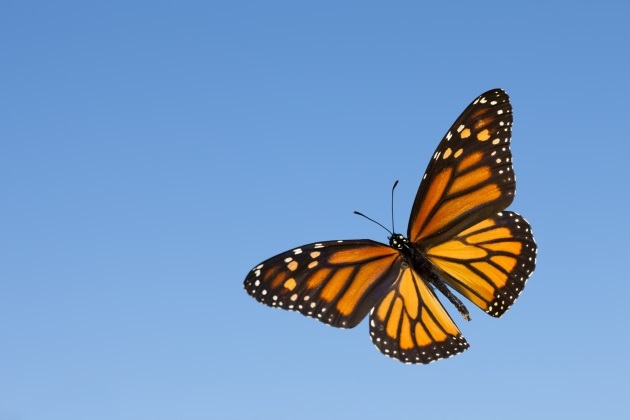 Monarchs have one of the most complicated migration patterns of any insect known, returning to the same trees each year, a specific behavior unique to the monarch butterfly. Another finding of the Florida study: Monarchs time their departure from Mexico in the spring so it coincides with the optimal growth of milkweed in Florida and other Southern states. The plants contain toxins that they store up to ward off predators.